A short 4-day cruise is a fun vacation that doesn't use up a lot of vacation time. There are some quick voyages available out of Tampa Florida. See the full list of departures below. The short cruises go to Cozumel (Mexico) or Havana (Cuba). 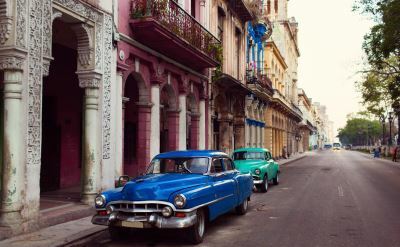 Some of them include an overnight stay at Havana, which enables you to stay out late at shows, restaurants or bars. These cruises are the same length. Carnival Cruise Line likes to use the term "4-day cruise" and Royal Caribbean prefers "4-night cruise", but they mean the same thing. Also check for 3-day cruises and 5-day cruises leaving from Tampa. 4-day cruises on Carnival Cruise Line. 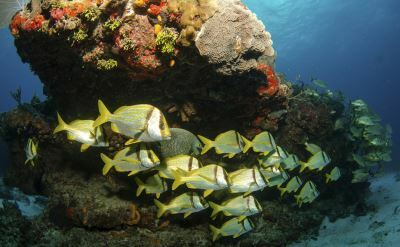 A round-trip cruise from Tampa to the island of Cozumel (Mexico). You'll depart at 4PM. The next day of your cruise will be spent at sea. Then you will arrive at Cozumel at 9AM and leave at 5PM. The last full day is another day at sea. You will be back in Tampa by 8AM. 4-night cruises on Royal Caribbean. Round-trip from Tampa to Cozumel (Mexico). The ship is scheduled to leave at 4PM. After a full day at sea, it arrives at Cozumel at 8AM and leaves at 6PM. Another day at sea, and you return to Tampa at 7AM in the morning. • 2019 departures: April 11, April 25, December 19. 4-night cruises on Royal Caribbean. Round-trip from Tampa to Cozumel (Mexico). The ship is scheduled to leave at 4PM. After a full day at sea, it arrives at Cozumel at 8AM and leaves at 6PM. Another day at sea, and you return to Tampa at 7AM. • 2020 departures: January 2, 16, 30; February 18, 27; March 12, 26; April 9, 23.